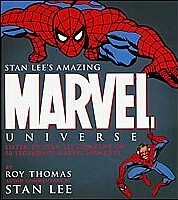 Stan Lee’s Amazing Marvel Universe, published by Sterling Publishing Company, Inc., 200 pages, $50.00. Surely, an adequate test of whether or not you’ve purchased a good book is a faint sadness at turning the last page. If so, then Stan Lee’s Amazing Marvel Universe is a good book. Written by Roy Thomas, a Marvel scribe and editor for many years, the book catalogs the major works of Stan Lee at Marvel in an insightful and entertaining manner. Highlighting 50 “legendary Marvel moments,” the book also treats fans to hundreds of full-color cover and page reproductions dealing with important events in Marvel’s vast superheroic history. Making the book even more enticing is the digital playback device that is attached. Containing 68 voice tracks from Stan the Man himself, readers can gain special insight from the uber-imaginative creator. These selected excerpts from an interview with Lee enhance the printed information and illustrative glory found within the pages to such a degree as to make this a must-have for Marvel fans, comic book enthusiasts, pop culture nuts, or what have you. If I were to wish one thing about this book, it would be that it could be thicker, with more pages and more information. Considering the years Roy Thomas spent behind the scenes at Marvel, he is in a position to reveal historical tidbits that many fans-turned-researchers could only dream of. As it is, he brings to light several items that I never knew, even after close to 35 years of reading comics. You might be surprised, as I was, to learn that Marvel’s character the Black Panther once changed his name for political reasons. Or that the Comics Code Authority rejected artwork for a particular Marvel comic due to a puff of smoke in the panel. Interesting stuff, to be sure. Stan Lee’s Amazing-Marvel-Universe is highly recommended for all fans of superhero comics, comic book history or Marvel Comics in general. Find it at comics shops, bookstores and online retailers and auctions.